two great nations divided by the same language. Australian English sits comfortably in the space between the two. Australian English began in the early days of settlement as English English with a healthy dash of Celtic influence from the many Scots, Irish and Welsh settlers who came to Australia. Large numbers of German settlers also came in the 1800s,and their influence on the language is also clearly evident. For over a hundred years, Australia developed in splendid isolation its unique blend of English, tempered by the hardships of heat and cold, deluge and drought, bushfires and cyclones. The harsh environment united people in a common struggle to survive. People helped each other. Strong communitarian loyalties were engendered. It is from this that the egalitarian character of Australia evolved. There is a strong emphasis on building a feeling of solidarity with others. Strangers will call each other "mate" or "luv" in a tone of voice ordinarily reserved for close friends and family in other parts of the world. Everyone was from somewhere else, and no-one was better than anyone else. A strong anti-authoritarian attitude became deeply embedded in Australian English. This was mainly directed towards their British overlords who still ran the country as a profitable colony. The Australian sense of humour is generally understated, delivered with a straight-face, and is often self-deprecating in nature. No-one wants to appear to be up themselves. Harsh or otherwise adverse conditions had to be met without complaint, so when discussing such conditions, it was necessary to do so with laconic, understated humour. Anyone not doing so was deemed a whinger (win-jer).Following World War II the American influence came increasingly to influence Australian culture and therefore the language. No-one is better at selling their popular culture to the world than the United States of America. Their pop culture is a beguiling instrument of foreign policy, so pervasive and persuasive it is. Young Australians enthusiastically embraced American culture, and since the 1940s the old established British language and customs have become blended with the American. If Australian English has a remarkable quality, it is the absence of regional dialects. It is spoken with relative uniformity across the entire nation. Brisbane on the East coast is a 4,300 kilometre (2,700 mile) drive from Perth on the West coast, yet there is little discernible linguistic difference between the two places compared with the difference, for example between Boston and San Francisco in the US. Nowhere else in the world do we see such linguistic uniformity across large distances. 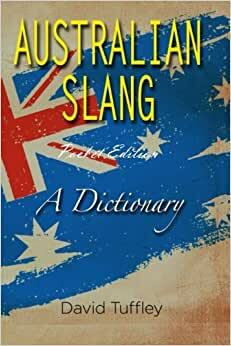 Start reading Australian Slang: A Dictionary on your Kindle in under a minute. A handy and entertaining little book but like most things there is room for a little improvement. Mr Tuffley shows his Brisbane origins in his definition of "Buckleys". He omits to say that it is a rhyming slang coming from Buckley & Nunn, a long defunct Melbourne department store. He omits "One Eyed" which means excessively focused on one thing (usually a particular Aussie Rules football team, here in Melbourne anyway). During a visit by President Obama, our then Prime Minister, Julia Gillard used the phrase in conversation with the President. He was very taken with it and thought that it would be very appropriate when referring to some politicians in the US. Ain't that the truth - particularly right now ! I like this book and recommend it. I have only lived in Australia for 50 years, so I am a relatively recent arrival compared with Mr Tuffley,but I can recall using close to 90% of the words/phrases during that time. I am intrigued by the other 10%. Next month I am joining an American team volunteering in Vietnam. I am sure that they will be amused by most of the expressions in this book. I meet up at a Sailor Moon related forum and I'm a good friend of a co-admin. The challenges with him was he lived in Australia, which is across the ocean, equator and date line. Taking into account metric measurement, his distance, the weather in the Southern Hemisphere and the fact our communiques may be delay was find, but the terms he used from time to time, meant deducing from context. Eventually, I had a chance to go through it and now everything is clearer now. I admire when I'm given the definition to Aussie slang (some of which is part of the American lexicon and phraseology). I give it 5 stars for the fact it had help a lot in clarification of born-and-bred Aussies and the slang that made their culture. 5.0 out of 5 starsLondon to a brick THIS book does the trick! Mr. Tuffley's book is a must have for World travelers visiting a wonderful country, known universally as, the "land down under." I had the privilege to visit both Albany and Melbourne in Australia back in 1992. During that time I was a sailor onboard the USS Kinkaid, Destroyer (DD-965). This brilliant book would have a been the quintessential companion for me on my visit at that time. Outstanding, charming and quite educational. Hey Dave, remind me to buy you a VB, if I ever have the honor of meeting you at the local pub. Keep up the outstanding work and God bless you sir. Bought as a going away gift for someone relocating to Australia from the US. 5.0 out of 5 starsGday from down under.